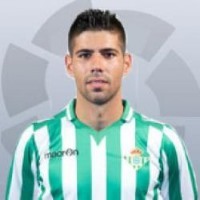 Valencia CF is supposedly interested in Real Betis player Juanfran or Juan Francisco Moreno Fuertes in full and he plays as a winger, secondary striker and right back and his versatility is why Valencia CF is interested in him as we can be cover for Feghouli as well as the right back spot and even play as a striker if the team is suffering with many injuries. He is 25 years of age and has played 34 times for Real Betis since 2013 and costs around 4 million euros. His versatility, low cost, willingness to join Valencia CF and relatively low salary is why Valencia CF is interested quite a bit in the player.